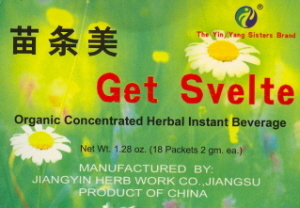 If you want Chinese herbs for weight loss then Get Svelte (苗条美) is the product for you. Get Svelte is an easy to use weight-loss tea which also strengthens the metabolism and improves vitality. Use it with meals or at the gym. The Chinese herbs in the formula have the following functions: Hawthorne assists digestion. Recent research has shown it is good for high cholesterol. Salvia is good for overall circulation. Cassia moistens the intestines and unblocks the bowels. It has also been shown to lower serum cholesterol. Alisma has a mild diuretic effect. Formulated by Letha Hadaday, L.Ac. Ingredients: hawthorne, beggarticks, salvia, cassia, alisma, winged euonymus stem (Chinese: Gui jian yu). Our East Earth Trade Winds herbalist says "Beggarticks...what a name!" Not to worry though. Beggarticks is the common name for the herb Bidens bipinnata (Chinese: Gui zhen cao) which is a common substitute for Herba Siegesbeckiae.